A Delivery Unit has been working in Peru for four months. It supports the planning and implementation of government goals in seven priority areas. Peru’s government has drawn up specific objectives in seven areas which will be directly monitored by the new Delivery Unit, which was officially presented on 25 January 2017 by the Peruvian Prime Minister Fernando Zavala. Delivery Units, or ‘deliverology’, is a methodology applied to governments to meet certain priorities. With systematic monitoring, Delivery Units can tweak and fix policies, depending on results. This model has been applied in Peru for four months in collaboration with Sir Michael Barber, who specialises in improving government performance. His method will support the Peruvian government in its planning and delivery of seven priority goals: health, water and sanitation, formalisation, security, education, anti-corruption, and infrastructure. The Delivery Unit will also allow the government to monitor and evaluate its progress, facilitate monitoring and reporting to ministers, and build its management capacity. 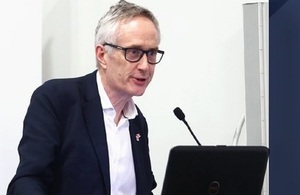 On 26 January, the British Embassy in Lima and Pacific University’s (Peru) School of Public Management hosted Sir Michael Barber’s keynote address: ‘Designing Compliance Units: Opportunities and Lessons Learned for Peru’. Notable attendees included HMA Anwar Choudhury; José Luis Bonifaz, Director of the Public Management School; Ernesto Balarezo, Head of the Peruvian Government’s Delivery Unit; and Arlette Beltrán, a professor and researcher at the Pacific University. In his talk, Sir Michael Barber explained that governments should have their goals and priorities clearly identified, making it easier to apply the best strategies to achieve those goals. ‘Policy represents just 10% of the task. The remaining 90% is about how to make it happen’, he said. Many governments spend their time going from one crisis to another. And although this is necessary - governments must manage all crises - it is essential that the priorities that have been established from the start are not neglected. This requires a constant boost.